I suspect all of us have, at some time, lived an “if only” life. It could be about anything: our nation, our church, our society, our schools, our family, our marriage, our children, our selves. Ultimately, though it is about the past. We want to preserve what was and keep things the way they’ve always been. We want to undo what is and go back to what was. Sometimes the words “if only” betray our attachment to the past, our dislike of what is, or our fear of something new. Almost always they come from a place of sorrow and loss, regret, failure, or disappointment. The illusion of “if only” wraps around our lives like grave clothes. We use it to try to bind up what has fallen apart, preserve what is decaying, and tie us to what has been lost. If you know the illusion of “if only” then you probably know Mary and her sister, Martha. 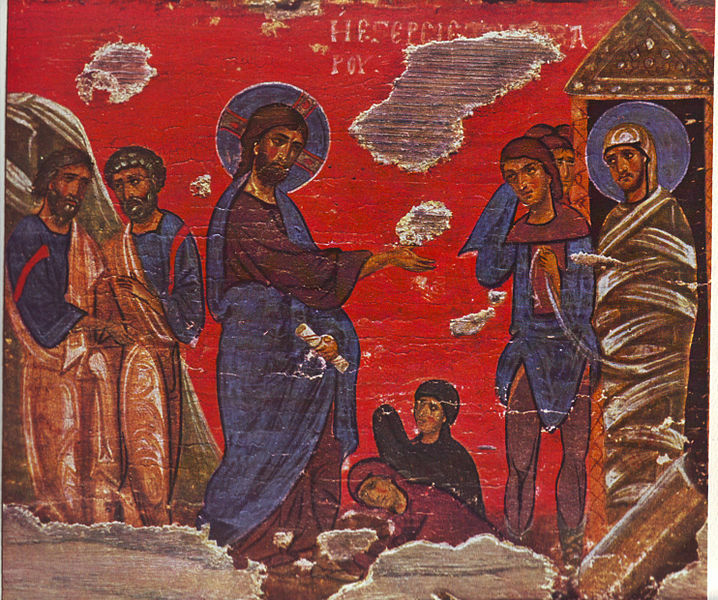 By the time Jesus arrives, Lazarus has been in the tomb four days. His hands and feet are bound with strips of cloth. His face is wrapped in a cloth. According to Martha, he’s not just dead, he’s stinky dead, hopeless dead, beyond help dead. Martha’s sister, Mary, is weeping. The Jews are weeping. Lazarus has passed away. Mary’s first words to Jesus are, “Lord, if you had been here, my brother would not have died.” They are the same words Martha said to Jesus just a bit earlier. Some of the Jews ask, “Could not he who opened the eyes of the blind man have kept this man from dying?” Everyone wants Jesus to turn back time, to preserve the past, and maintain what was. If only Jesus had been there. Every death, loss, disappointment, and failure is a passing away that reveals a new life. Every tear cried is a tear God wipes away. Every “if only” is a place in which Christ is making all things new. Whatever the circumstances of your life might be, they are being made new by Christ. We no longer have to seek the old heaven and earth. A new heaven and earth, a new Jerusalem, and a new life are being given to us. That means, however, that we must unbind the past and let it go. Unbinding and letting go of the past are not a rejection but an offering. We do not reject the past, throw it away, or deny its value and importance to us. Instead, we free it to be made new, to be given new life, to become a new creation. In so doing, we discover that we too have been freed, we too have been given new life, we too have become a new creation. That is the celebration and gift on this Feast of All Saints. The saints are ones who were willing to unbind and let go. They trusted the new creation of Christ more than they did the circumstances of their past. They did not look to the past but to what might be. They refused to live an “if only” life. They are our witnesses that it is safe to die, that passing away, in whatever form it might take, is not an ending but a beginning. They guide, companion, and pray for us in our unbinding and letting go. They encourage and support us in becoming a new creation. Every time we refuse to live an “if only” life, every time we unbind the past and let it go, we return to the waters of our baptism. We offer our selves to be made a new creation and God himself is with us. This sermon was based on Revelation 21:1-6 and John 11:32-45. The collect and readings for the day, All Saints, Year B, may be found here. Thanks Deb. I’m glad you liked it. This was a very beautiful and helpful sermon. I really appreciated it as it spoke directly to some concerns I have been dealing with lately. Thank you! Robin, I am glad the sermon was helpful. May God’s grace unbind and free you from the past as he calls you into new life. That was Great…AND RELEVANT to ALL of us…. Thanks Mike. I appreciate your encouraging words. This is beautiful. Thank you. Your words have touched my spirit.